Extremely scarce Colton pocket map of the United States. 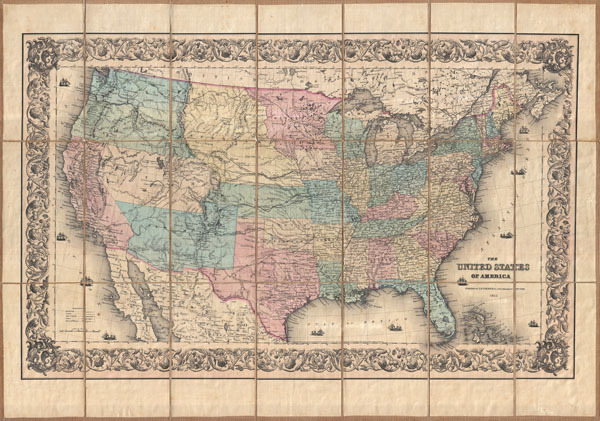 This is an extremely scarce separately issued 1855 pocket map of the United States by J.H. Colton. Covers the United States from coast to coast revealing a very early configuration of the Transmississippi. While many modern states had not yet appeared when this map was printed, many other states are exceptionally large. Oregon, Washington Utah New Mexico, Minnesota, and Nebraska, territories all, covered vast regions. A number of extremely important emigrant routes are also noted, including the Oregon Trail, the Santa Fe Trail, and Fremont's Route. Additionally indicates the many routes proposed for the Pacific Railroad including the Stevens route far to the north, two central routes through Utah, and two southern routes through New Mexico. This map is cartographically very similar to Colton's 1855 atlas map of the United States though offers a number of deluxe features including dissection and mounting on linen, an elaborate decorative border, and 11 sailing ships plying the seas. This particular example was originally exported and sold in France by the Longuet firm and was originally owned by G. R. Rupoll or Rupell. Very good. Dissected and mounted on linen. Original linen intact but very fragile, separated here and there.